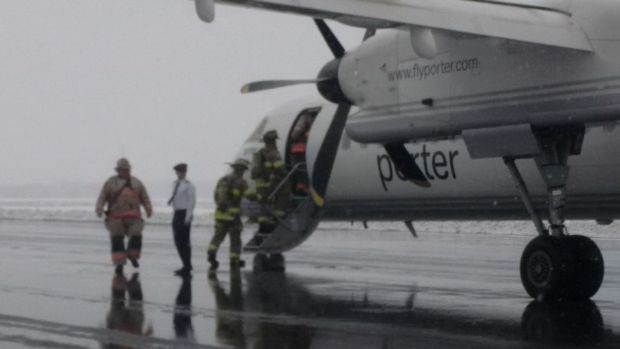 The passengers and crew of Porter Airlines flight PD1480 had a frantic few moments after an electrical fire in the cabin forced the Q400's crew to make an emergency landing at Fredericton Airport, New Brunswick. Flightradar24 tracked the flight path of C-GLQG. The Canadian Transportation Safety Board has deployed a team of investigators following the diversion to the Fredericton Airport by the Porter aircraft. The TSB have said their team will gather information and assess the occurrence. Porter Airlines flew a replacement aircraft from Toronto's Billy Bishop airport to pick up the stranded passengers and fly them on to their destination - Montreal. The Canadian carrier told us "Porter flight #1480 diverted to Fredericton Airport on Saturday morning. The crew reported some electrical sparking that was contained prior to landing. The flight was operating from Halifax to Montreal with 72 passengers and four crew members. Everyone involved safely exited the aircraft in Fredericton. We scheduled another flight for passengers to travel to their destination on Saturday afternoon. The aircraft involved will be inspected and assessed prior to becoming serviceable at a later time. This is all of the information we have to provide." This is the latest in a string of events causing the expanding Porter PR problems in recent months, the airline's twitter stream is regularly filled with reports from passengers complaining that their flight has technical delays only for it to be later cancelled due to 'weather conditions' which flyers believe is a way the airline can avoid paying compensation. The carrier has also angered some frequent travellers with the introductions of fees for selecting seats in advance or at check-in, otherwise, seats will automatically be assigned, which has seen travelling companions sat in different areas of the aircraft. In January passengers of another Porter Airlines flight were threatened with arrest if they didn't delete videos of Porter employee being 'rude and aggressive' to them after their flight was cancelled after a two-hour delay. In July last year, the airline caused much disruption to flyers journeys by cancelling flights at short notice or no notice. In January 2017 over 400 passengers were severely impacted because of a Porter system failure.